Like many of her contemporaries Nicolson came to film from painting. 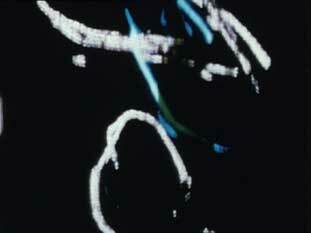 The move towards abstraction in her paintings and chance encounters at Edinburgh College of Art with the direct-on-film work of Norman McLaren and Len Lye led her to pursue her own experiments, although it wasn't until her return to London and the Arts Lab that she made her first film, a short hand-painted and scratched loop, Abstract No. 1, presented at an open screening there in 1969. The involvement with the Film Co-op, then very much part of the Arts Lab, where Nicolson was organising gallery shows of mixed-media events and 'happenings', and access to modest 16mm equipment through a post-graduate course at St Martins, provided the catalyst for a number of short films made between 1970 and 1976. After Abstract No. 1 and Anju (1970, occasionally shown double-screen), a delicate, textured portrait of a young Indian woman, came the three films which encapsulate Nicolson' s tactile and intuitive method of working: Shapes (1970), Slides (1971) and Frames (1971-72). Slides was assembled from precious fragments of earlier 16mm and 8mm films and 35mm slides of her paintings, which were cut into thin strips and taped together to form one long strip This was hand held in the Co-op's contact printer and moved up and down during printing. The images are mostly abstract, with vibrant colour flares, sewn and hand-painted sequences, a woman's face and other recognisable snippets interacting with framelines, sprocket holes and edge lettering moving in and out of the picture frame. The film's dynamism lies between the stillness of the original images and the on-screen movement, orchestrated by manipulating the speed and duration of the filmstrip against the printer light. This was undertaken whilst watching through the printer's viewer. "Slides came about very naturally… a clear development from my painting, something that I felt comfortable with that I could hold it in my hand. I could respond to the material, it was in my hands rather than in a camera." Watching the film we share the filmmaker's fascination with this transformative process. "It was an exploration of the things I liked about film, the light, colour, intensity; a chance to look at it all in depth." Shapes, made before Slides, is also about re-examining and re-working filmed material. The original was shot on the roof of St Martins and in Nicolson's studio, where strips of coloured paper and gels were suspended from the ceiling creating a dense environment through which she wandered with a hand-held camera, often recording the installation in extreme close-up. The colours, shapes and rhythms of the original elements were developed by re-filming off the screen, deploying varying projector speeds, superimpositions and in-camera editing to create a richly-textured abstract vision. "I liked what you could do with re-filming because it gave you a chance to be more fluid… and then I got interested in the dust and the dirt and got quite swept away by that, by these little particles." Frames, made after Slides, uses 8mm footage shot in Italy which underwent a process of deterioration through its use in an extended performance (over a whole weekend) during a Filmaktion presentation at Gallery House. Improvising with this material, images were directed around the room via a hand-held condenser lens to bounce off different surfaces. Like the filmstrip in Reel Time, this 'mishandling' meant it got very torn and scratched. This became the 'raw' material that was put through the Co-op contact printer to produce a 16mm film - a similar technique to Slides but with a different history.